Finally, after months and even years of speculation and teasing, Samsung has unveiled the South Korean company’s actual prototype for a foldable smartphone at their 2018 Samsung Developer Conference last night in San Francisco set to launch next year. The new phone technology, built in collaboration with Google, is dubbed the ‘Infinity Flex Display’. The foldable phone was brought out by SVP of mobile product marketing, Justin Denison who claimed the device is “stunning”. 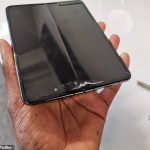 In a video which is circulating the internet, you can see Denison folding out the device into a tablet and back to a phone with a 7.3-inch display. Denison walked out on stage, lights were dimmed and the phone was revealed. When folded it looks like a clunky enough device, however, while many were speculating that a hinge could be a part of the new foldable device, the folded out tablet screen is flush and looked sharp. Allegedly this cover display can be folded back and forth numerous times due to the Infinity Flex Display’s thinness and flexibility. Reportedly, up to three apps will be able to run at the same time on the device, and transition from the small phone screen to the larger tablet screen, in what Samsung calls a “multi-active window”. Google is officially supporting these new foldable devices with Android and providing guidance for developers to begin using built-in features in Android to support these foldable displays. Samsung hasn’t revealed any other details about the device, but Denison claimed that the firm will be able to start mass production of the Infinity Flex Display in a “matter of months”. Foldable phones have been the next step that phone manufacturers have been trying to perfect for many months with leaks and teasings from manufacturers the world over. Royole’s device was leaked only last week, Huawei is reportedly working on a device, Apple and LG are even rumoured to be working a foldable device. The foldable phone wars have begun. UPDATE: CNet’s Shara Tibken tweeted out an image revealing more specifications of the new foldable device. The image shows that the pixel density is standard 420 ppi, nothing groundbreaking but respectable. The resolution when folded is 840 x 1960, and 1536 x 2152 when unfolded. When folded flat, the Infinity Flex has a 4.58-inch display with an aspect ratio of 21:9, which isn’t ideal for game-play, watching videos. When unfolded, in tablet mode it has a 4.2:3 aspect ratio and a screen size of 7.3 inches, much more suited to videos and games and more, making it seem like this is the main screen and the front “cover display” is for answering calls or replying to messages conveniently.